First, you’ll need to gather all of your supplies and ingredients. This may take a while. I’ll wait. And now that I think about it, you don’t really want to get your yogurt out just yet either, but do make sure you have some. Pour the milk into the Crock Pot. Cover, turn on low, and cook for 2 hours. 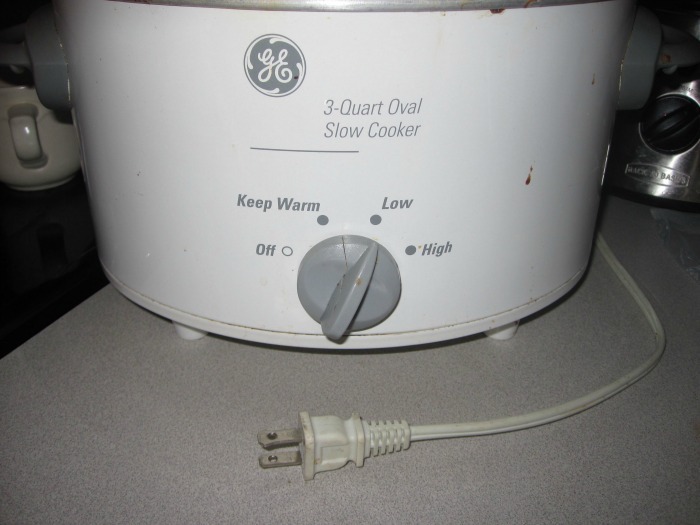 Unplug the Crock Pot and let it cook another 3 hours. 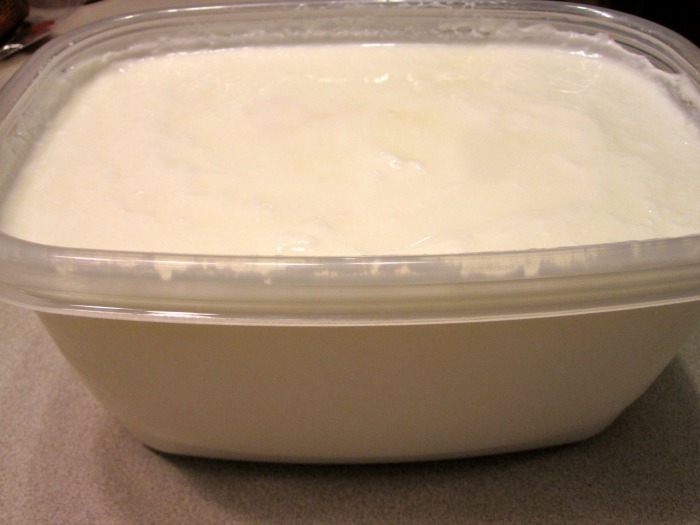 After yogurt has cooked 3 hours (for a total of 5) transfer about 2 cups of the warm milk to a bowl. Add 1/2 cup of plain yogurt (from the store for your first batch, then save some from this batch for your next one.) and whisk together until blended. Put the cover back on (still unplugged). Wrap the Crock Pot with a thick towel to keep it insulated. Leave it for 6-8 hours. Overnight works well if you time it right. 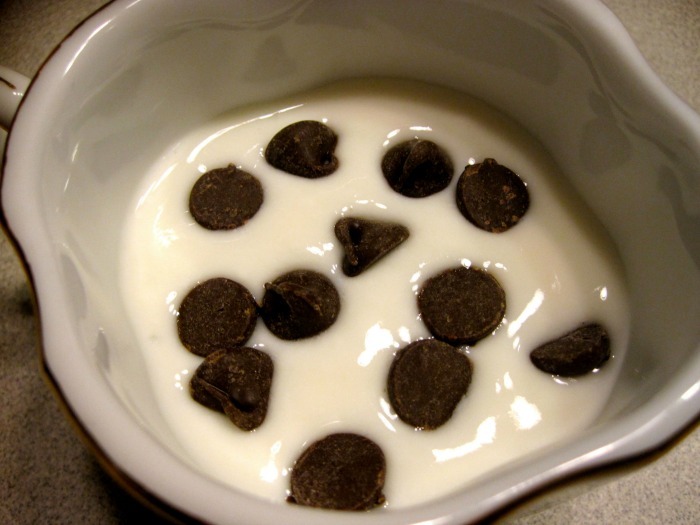 I added chocolate chips and had a happy little boy at snack time. You can add stevia if you like. I may experiment with different flavors and add-ins. I’ll report back with my results. Mine was a little looser than store bought but I could just strain it a little through a coffee filter. Or, since I mostly use it in smoothies, I think I’ll leave it. I’d hate to strain out the healthy stuff. If you have a thermometer, I’d recommend using it. You want to keep your mixture at a temp between 110°-130° Too low and it won’t work and any higher and you can kill the active bacteria. I may have let mine get too high. I ended up turning my slow cooker back on because the temp had gone too low. I left the house for a while and couldn’t check it. I probably needed to turn it back off sooner. But it looks and tastes like yogurt so I guess it’s OK. Next time I’ll stay home and monitor it better. Maybe I didn’t wrap it well enough. Anyway, that’s my escapade for this week. I’ll probably try it again when this batch is gone and use another technique. I’ve read about using a heating pad, maybe I’ll try that one. Have you made yogurt? Please share your experience in the comments, we want to hear what you did and how it came out! 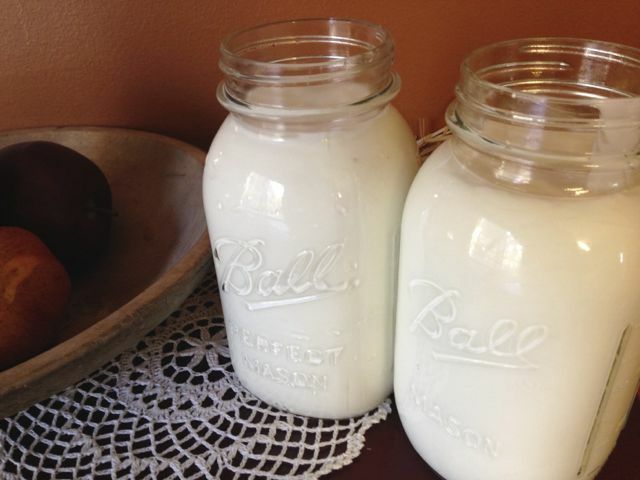 Smooth, creamy, homemade yogurt. Save money on those morning smoothies! ½ gallon whole milk. Avoid ultra pasteurized. ½ cup plain yogurt. Organic is best. Make sure it has live active cultures. 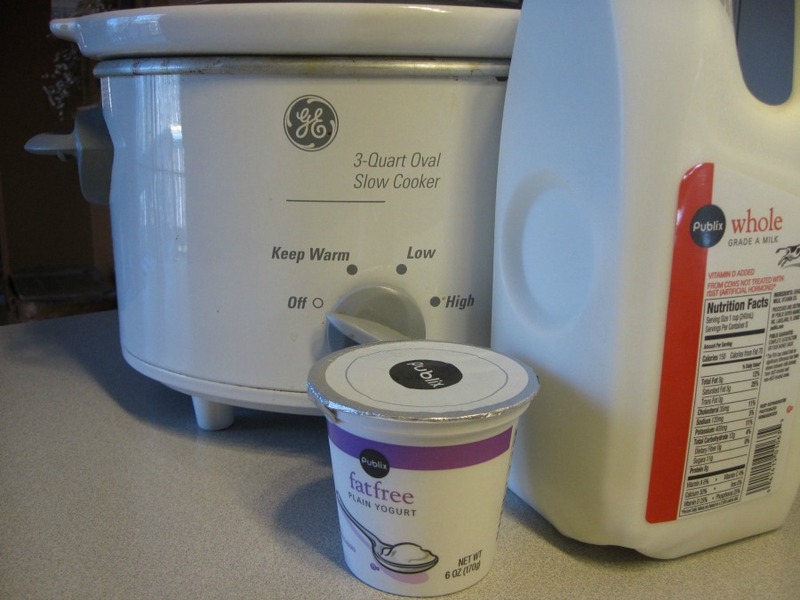 Pour the half gallon of milk into the slow cooker. 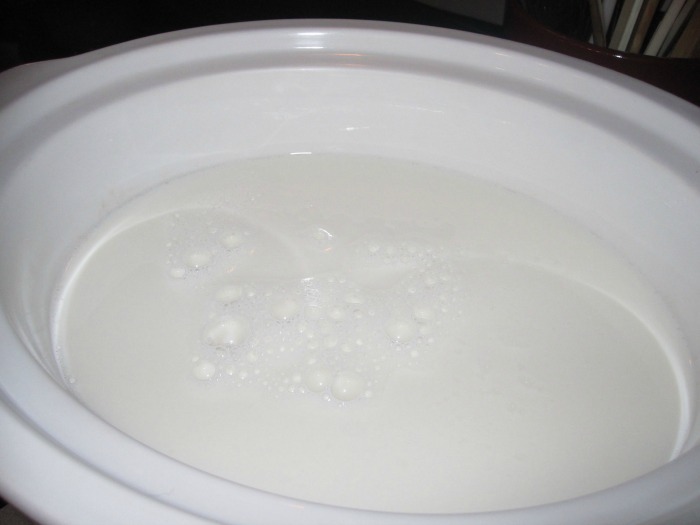 After the milk has been warming for 3 hours on low, put about 2 cups of the warm milk into a bowl. Add ½ cup plain yogurt and whisk together until mixed. Add mixture back into slow cooker and stir to combine. Put the cover back on the slow cooker (still unplugged). 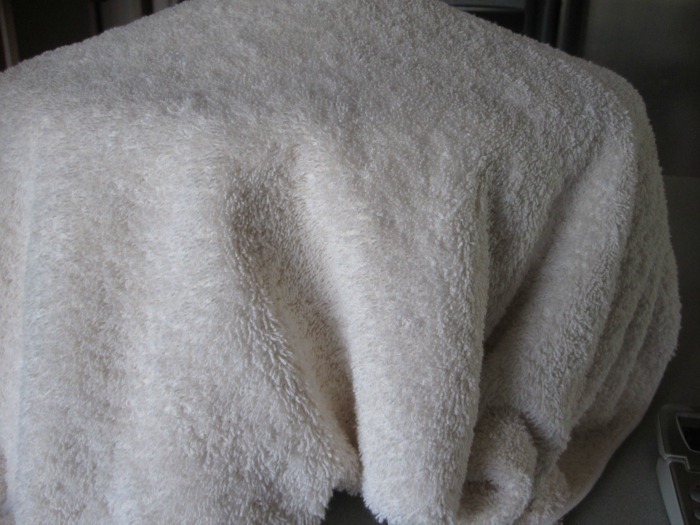 Wrap the cooker with a thick towel to help insulate it.